Asteroids that might threaten Earth could pose achallenge beyond the obvious, if nations can't get their act together andfigure out a unified plan of action. There are currently no known space rocks on a collisioncourse with Earth, but with ample evidence for past impacts, researchers sayit's only a matter of time before one is found to be heading our way. A swarm of political and legal issues bedevil any nationalor international response, whether it's responsibility for collateraldamage from deflected asteroids or the possible outcry if one country decidesto unilaterally nuke the space threat. "The word 'unorganized' is spot on here," saidFrans von der Dunk, space law expert at the University of Nebraska-Lincoln. "There is no such thing as even a platform for some level of coordinationregarding possible responses — and, to be honest, some quarters very much wouldlike it to remain that way." Legal experts discussed such problems last week at aUniversity of Nebraska-Lincoln conference titled "Near-Earth Objects:Risks, Responses and Opportunities-Legal Aspects." Their talksunderscored how underprepared the international community is to deal withpolicy and legal fallout from a potential asteroid threat. Many scientists have already brainstormed a variety ofways to deflect or destroy rogue asteroids, such as sending out spacecraft tonudge the space rock aside for a near-miss or simply blasting it apart. Butsome solutions may have different levels of appeal for various nations,especially when they involve launching potential weapons into space. For instance, international concern surrounded a U.S. shoot-downof a failing satellite last year, not to mention China's 2007 knockout ofits own aging weather satellite with a ballistic missile. Both cases raisedworries about the demonstration of potential missile defense systems orsatellite-killer technologies. "The international political reactions to the U.S.shooting down of its own satellites a year ago to prevent presumably dangerousand toxic fuel from reaching Earth only foreshadows what would happen if theU.S. 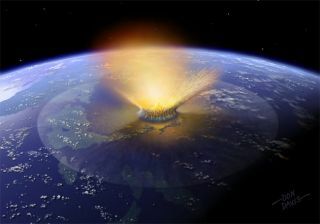 would detonate nukes claiming to destroy an incoming asteroid," vonder Dunk told SPACE.com. Other scenarios could highlight the question ofinternational unity. A United Nations Security Council decision on a certainasteroid response would likely shield participating nations against any liabilitiesfor collateral damage from a failed deflection or interception attempt, if thepast serves as any guide — the U.S. and other coalition nations that kickedIraq out of Kuwait in 1991 were not held responsible for damages to Iraq underSecurity Council mandate. Von der Dunk also posed the tricky question of what theinternational response would be if a smaller asteroid was headed for NorthKorea. The politically isolated nation attempted but failed to put a communicationssatellite into orbit in April, and would almost certainly requireassistance from the U.S., Russia or China to deal with an asteroid threat. Better international cooperation might also help infiguring out how to assess asteroid threats and release potentially scary infoto the public. "We have already seen scares raised by scientistsready to put out alarms out there, when either their data (fortunatelyquickly!) turned out to be considerably flawed, or later data allowed for amuch more precise estimate of the risk — which turned out to be muchlower," von der Dunk said. He pointed to the case of the Apophisasteroid, in which astronomers initially gave a one-in-37 chance of itstriking Earth in 2029, but later refined chances of collision to almost zero. Experts at the conference agreed to keep pushing forwardon legal issues, as well as focus on general education on the asteroid threatfor policymakers. And they even discussed how private companies might join inthe effort to monitor asteroids, potentially for the purpose of extractingmineral wealth from space rocks. Von der Dunk heads next to the Planetary DefenseConference in Spain April 27-30, where he will present the conferencerecommendations to the International Academy of Astronautics and the EuropeanSpace Agency.